Turned on/off by changing the installation direction. 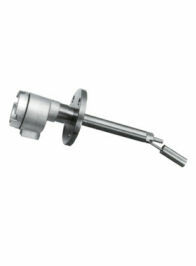 Other coupling methods (various flanges, ferrules, or screw-in items) and pressure withstand types are also available. The series can be made intrinsically safe and explosion-proof by combining it with a relay isolator. 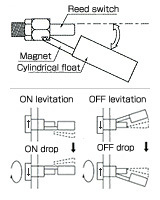 A reed switch is integrated inside the system as shown in the figure. When the magnet in the float arm comes close the reed switch, it turns on. If the magnet moves away from the read switch, it turns off.